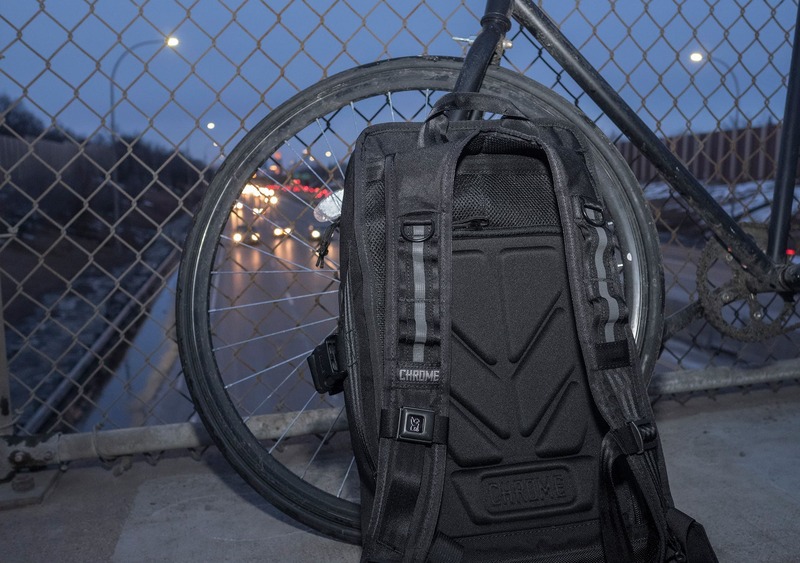 In this review we are taking a look at the Niko F-Stop Camera Backpack from everyone’s favorite urban-themed, gryphon-logo’d, seatbelt buckle backpack brand—Chrome. These guys have been making packs for a long time now and have really honed their skills on messenger bags and camera bags. 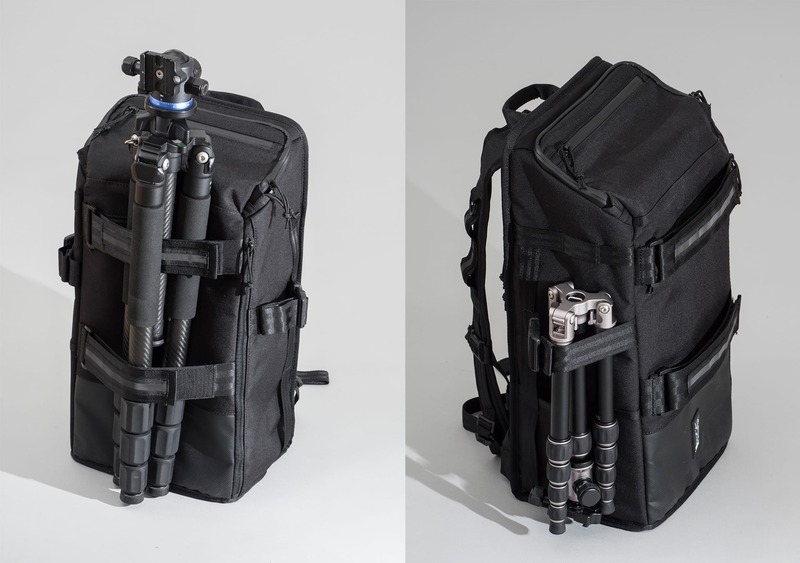 The Niko F-Stop is a medium sized backpack that has a heavy focus on camera gear. 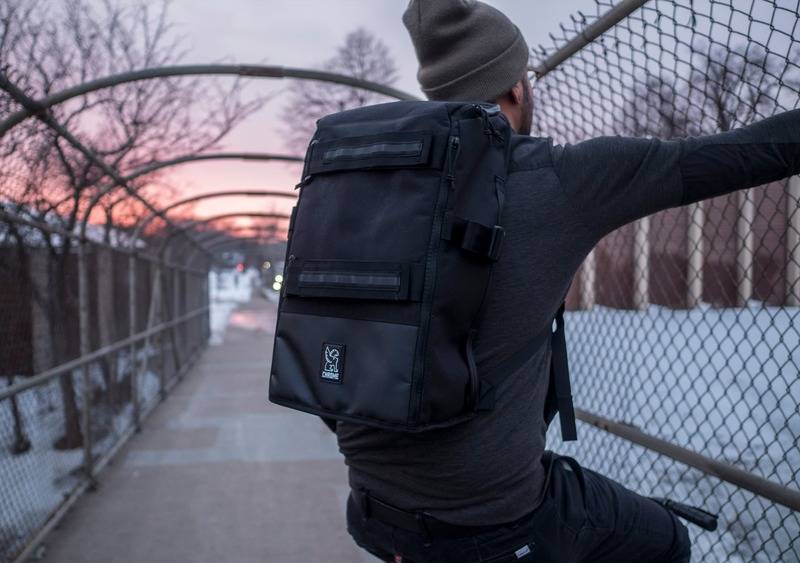 It’s got some great features for the urbanite photographer on the go, and we think it has a nice overall construction with some solid craftsmanship—much like the other Chrome gear we’ve tested out. So without further ado, let’s get into the specifics on this bad boy. At first glance, this pack has a nice, minimalistic look to it. It’s got a classic black look with some subtle branding and those trademark Chrome “seatbelt-style” straps. And it actually has a surprising amount of useful external features, but they’re cleverly hidden from view until it comes time to use them. We think Chrome has done a nice job on the overall dimensions of this pack. It’s got a rectangular shape which allows for a lot of storage, but it’s not overly chunky or bulky—especially compared to Chrome’s travel pack, the Macheto. It seems to be a nice compromise that allows for a good amount of storage and smart use of space while still keeping a relatively slim profile. The volume of this bag is around 23 liters (according to Chrome) and the dimensions are 10” wide, 20” in height, and 7” deep. As we said earlier, it’s sort of in that medium-sized range of packs. A little bit bigger than your average daypack, but not quite big enough to use as a one bag travel pack. It is, however, great for lugging around camera gear and some other basic essentials. As far as materials go, there’s some 1050D ballistic nylon on the exterior and a 400D tarpaulin interior. That ballistic nylon is pretty serious—you shouldn’t have any problems with scratches, rips, or tears. The tarpaulin is also a nice touch as it will add a layer of waterproofing. 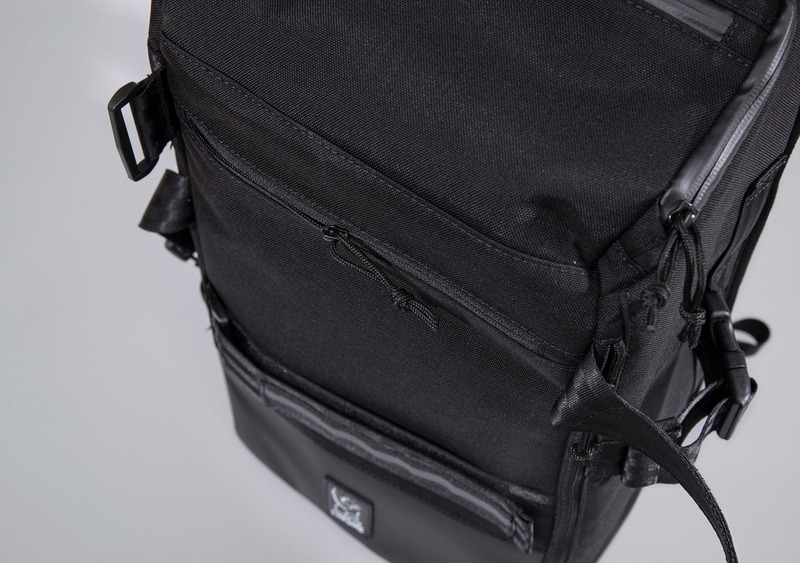 This pack is covered in YKK zippers which is always a great sign, and the top compartment has a YKK waterproof zip. This is a nice feature as that top compartment is the first area that will get hit if you’re caught in a rainstorm. Is it really waterPROOF though? We tend to be skeptical when it comes to this stuff, so we ended up testing it out. For more on that, check out the “Inside the Pack” section. The outside of this bag has a handful of awesome features. We’ll start by digging into the shoulder straps and back panel. The shoulder straps are made out of a breathable mesh material with a good amount of cushion. They also have these reflective stripes sewn into the nylon, which Chrome probably put in for cyclists—a nice feature in that regard, but we’re sort of indifferent. It could be a nice safety feature when walking in a dark city, or maybe you could use it for some sort of morse code signaling from your hotel room if you get the angles right. Because we do that all the time (obviously). 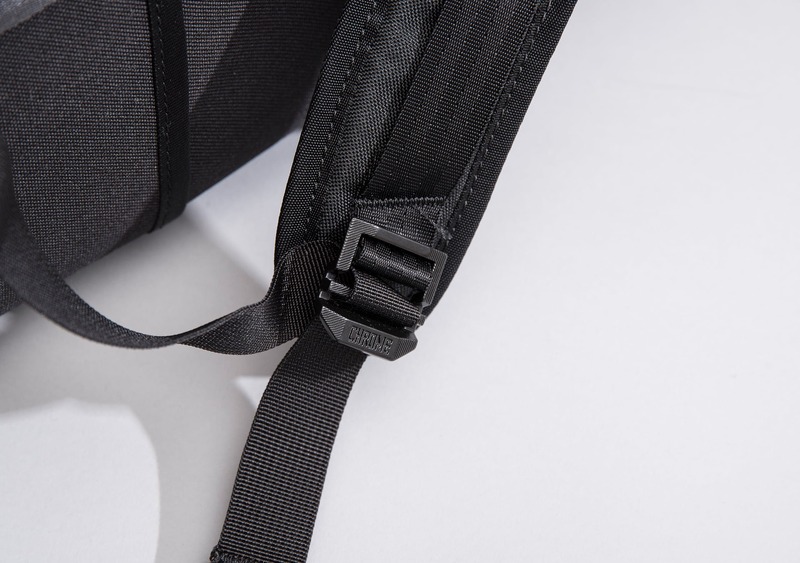 Each strap has a D-ring at the top that you could throw a carabiner on, and that reflective nylon webbing has some excess fabric which lets you loop things under it. We haven’t really been utilizing these, but they could definitely come in handy depending on your use-case. It may be possible to attach a phone here if you’ve got a case that will allow it. If you’ve got ideas, feel free to drop us a line—we’re curious! These straps can, of course, be adjusted via the buckles down at the bottom. All the components on here are metal, which is awesome. 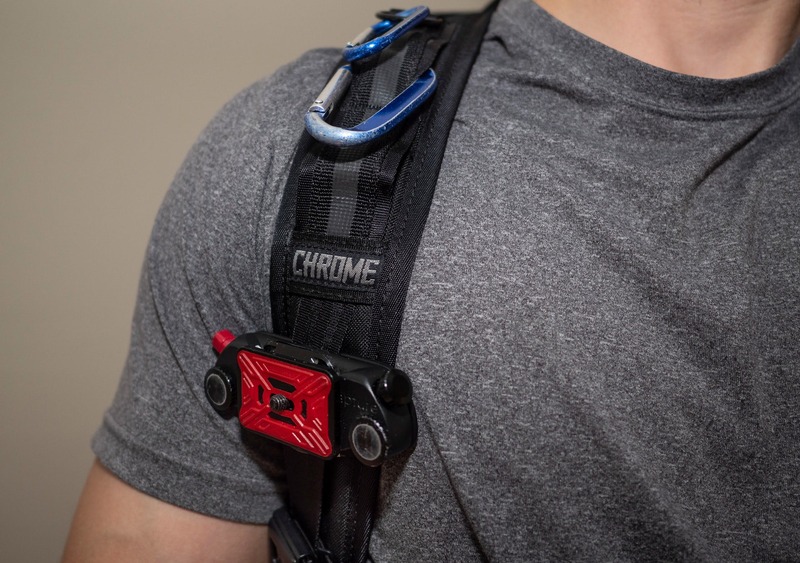 As long as the stitching can hold up—and judging by Chrome’s other work, it probably will—these straps should be pretty indestructible. The sternum strap is pretty unique—it’s got, essentially, a mini a tiny seatbelt buckle on it. 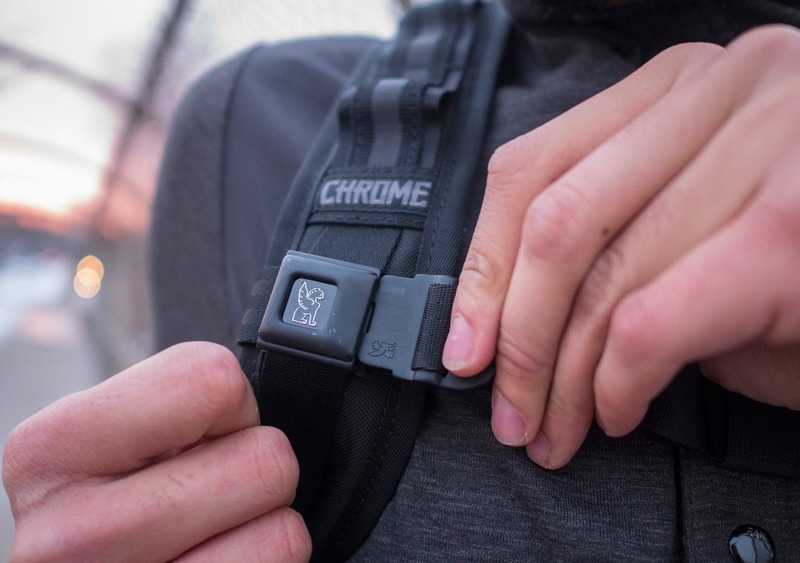 There’s a nice little Chrome logo (#branding) that you can push to release the strap, and you can easily adjust it up and down the shoulder strap as necessary. Honestly, we were pretty psyched to see this just because it’s a nice change from the standard DuraFlex buckles you see everywhere. This thing is super solid and one of the few metal sternum straps we’ve encountered! Our only complaint is that there’s no way to actually remove it, and there’s no way to attach it to one strap when not in use—which means you’re going to have a dangling sternum strap if you decide to leave it unclipped. 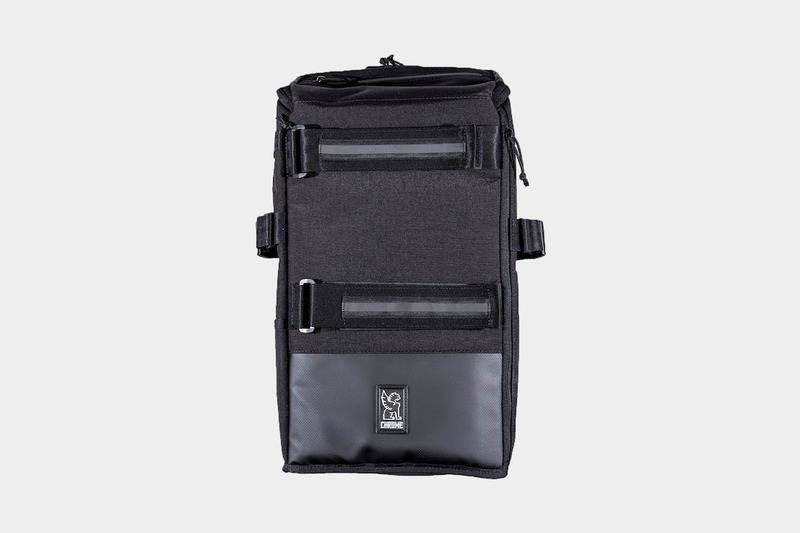 We should add that if you’re interested in throwing a Peak Design Capture Clip on this pack, we’ve found that the vertical nylon webbing where the sternum strap attaches is the ideal spot. Super easy to access and it’ll stay in place nicely. There is a hip belt on this pack, although to be honest—it’s pretty lackluster. You’ve basically just got a piece of webbing with a buckle on it, so there’s no padding and the width of the actual webbing is pretty minimal. What we’re getting at there is that this thing doesn’t provide much support and it’s not exactly comfortable to wear. If you couldn’t tell, we were a little disappointed with the hip belt. We tend to be middle of the road when it comes to hip belts, but this is a camera bag. Camera gear is heavy and hip belts are pretty essential when you’re lugging around a lot of heavy stuff. We think that Chrome could have stepped it up a bit with some extra padding or even just by making it a bit wider. It can, however, be removed easily. So that’s good. Moving on to the back panel, you’ll notice immediately that it has this sort of ninja-turtle armor look to it. Despite what you may think, this thing is not rock hard—all those shapes are actually filled with foam and provide some nice, comfortable-yet-firm support for your back. Each side of the pack has a compression strap which can double as an “accessory holder,” which is perhaps best for tripods. You can toss a tripod onto either side (assuming it compresses relatively well) which is super handy. 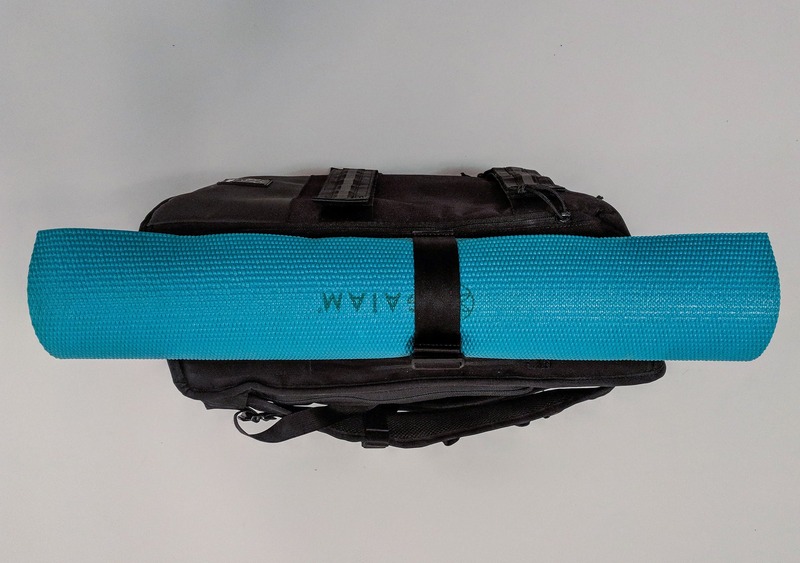 For those who aren’t as photographically-inclined, these straps are perfect for a yoga mat, a small sleeping pad, or really just any sort of long, cylindrical item. On the front of the pack there are two similar straps which also contain that reflective nylon. These are great for larger items that might not fit on the sides, and you could strap a rolled up jacket onto them. Or, if you really like tripods you could put two on either side and another one on the front! That would be pretty wild. While these do look like compression straps, we can confirm that they do very little with regards to compressing the bag. This is mainly because they just aren’t designed to compress, but the bag is also quite rigid as is. If you give it a good “squish” it will bounce right back due to all that padding—so even if it did have full-on compression straps, they wouldn’t do much good. Pro tip: If you do have a slightly larger tripod that you want to put on the front, you may want to arrange it like we have in the picture above—with the top strap kind of nestled in between the legs. This will prevent it from possibly slipping out of the straps. The last external bits are the top and side handles. 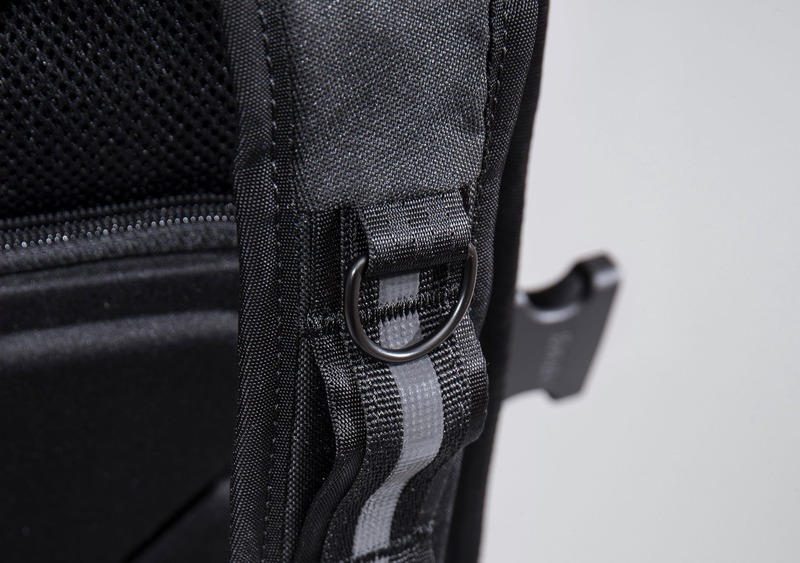 There is one handle on the top that is pretty standard—just some folded nylon webbing. This works in a pinch for grabbing the bag but isn’t exactly ideal for carrying. The side handles, on the other hand, work quite well for carrying the bag over short distances. They’re pretty hard to notice (if we’re being honest, it took us a while to even realize they were there) but they’re positioned well. They distribute the weight nicely and keep the bag level when in use. These ones also have a bit more padding than the top handles—if you’re bringing this thing into another room or just need to get out of that taxi quickly, the side handles are your best bet. For the interior components, we’ll start with the top pocket. Right at the top of the bag you’ll find a waterproof YKK zipper that opens up to reveal a decent-sized, rectangular-shaped pocket. 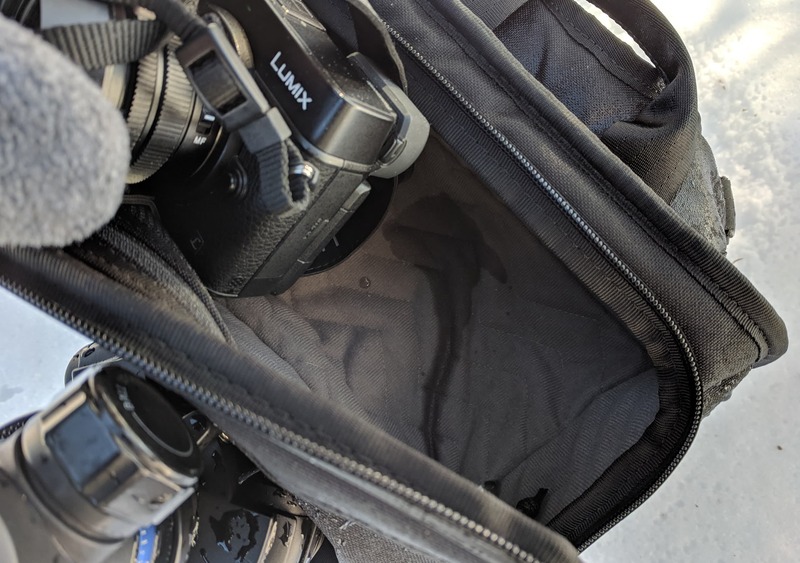 There’s some nice padding in here, and we’ve found it will easily hold a DSLR with a medium-sized lens with one additional lens, depending on the size. On the interior of the flap there is a mesh pocket that can hold a phone, external hard drive, or any other accessories you may have. If you’re like us, you’ll want to know how many Pop-Tarts this holds… and the answer is about one and a half—unfortunately, you’re going to have to cut one in half and throw it in a plastic bag or something. Now, while this area of the pack does have waterproof zippers, it doesn’t necessarily mean the entire compartment is waterproof. We went ahead and tested this out and we can tell you the entire compartment is most definitely NOT waterproof. Luckily, we had a waterproof camera in there at the time. So, just a warning that even though there are waterproof zippers you’re still going to want to be careful with this pocket. If you get caught running through a rainstorm you’ll most likely be okay. But if you leave your pack out in the rain or you end up walking through a legit downpour for a while—this pocket is not going to be dry. Overall, we’ve found this pocket to be super convenient and it’s great for the photographer on the go. When your waiter arrives at brunch and you forgot to get your camera ready, you can have this thing out in just a few seconds to snap that awesome #foodporn pic while only slightly annoying your table guests. In addition, this could be a great spot to throw some clothes and essentials for an overnight stay if the rest of the pack is filled with camera gear. You could easily fit a rolled up t-shirt, some undergarments, and a few toiletries in here. Moving on, there is a very unique laptop sleeve on this bag—it’s actually on the front of the pack as opposed to the back panel like most other laptop sleeves. It’s got a good bit of padding, but because it is right on the outside of the pack you’re going to want to be careful. If you toss this bag on the ground, chances are your laptop will be the first thing to hit. Not ideal, although we haven’t had any major issues yet. We are a bit disappointed to report that this sleeve will not hold a 15 inch Macbook Pro. Definitely a bummer, although it will fit a 13 inch laptop just fine. Now it’s time to check out that main pocket. This bad boy is only accessible from the back panel, which is a great feature for multiple reasons. 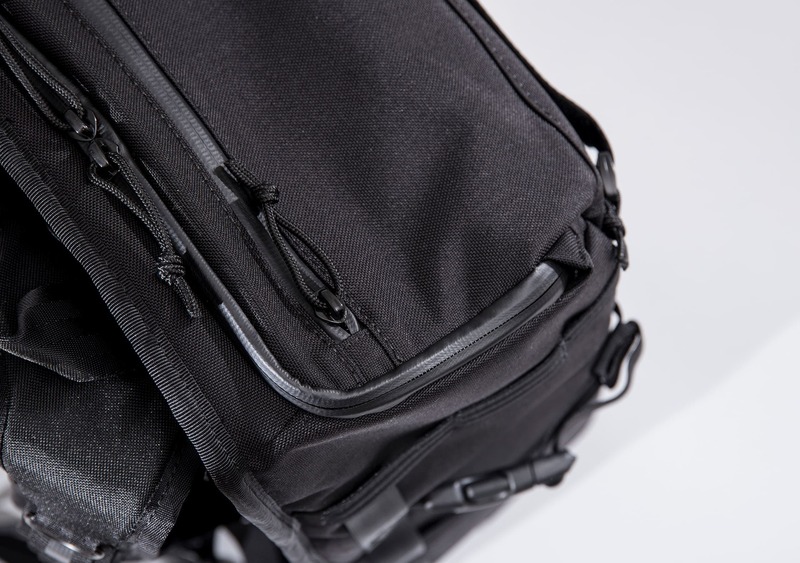 First, the back panel entry keeps your camera gear safe from potential theft. While you’re wearing it, there’s no way anyone is getting into that main compartment without you knowing. In addition, just the fact that there are no zippers means that it will take someone a bit longer to figure out how to open the damn thing. Any time you can make a thief spend just a bit more time getting into something means they are more likely to move on to the next opportunity. In addition to some added security, the back panel entry is far more accessible than you may think. Most of the time when you take a backpack off, you’re taking off one strap and kind of swinging it around your body. When you go through this motion, the pack panel is right in front of you—just set the bag down and you’re into it in no time at all. Not only that, but the bag will sit very nicely on the ground this way, as opposed to having it sit unevenly on the shoulder straps and hip belt. All in all, it’s a nice system and the convenience may surprise you if you’ve never had a similar pack. 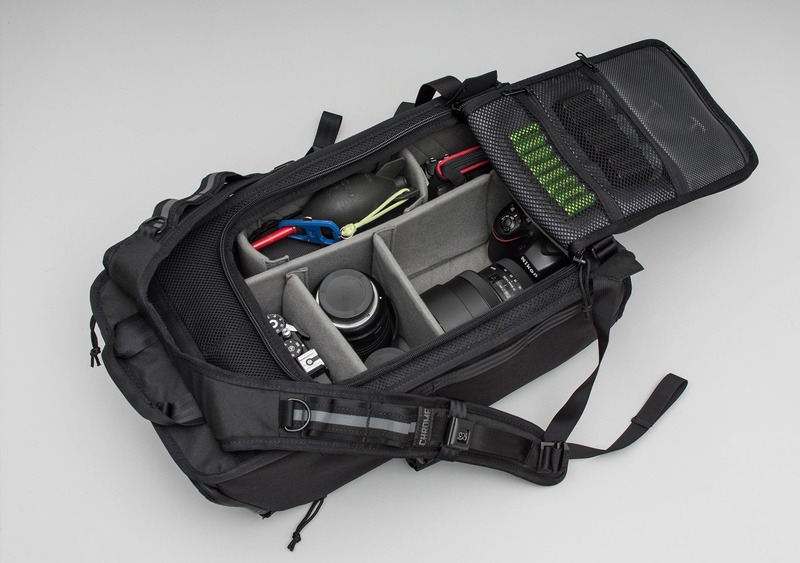 Inside this main compartment there is a series of dividers to keep your camera gear safe and organized. These things are well padded and have super grippy velcro that allows you to fully customize the layout to your liking. You’ll probably want to do some customizing of your own based on your loadout, but you can take a look at what we have for an idea of this things capabilities. You can easily fit a few camera bodies in here with a handful of lenses and have room for a couple other knick-knacks. If you’ve got some big boy lenses, you could probably change the layout to accommodate them vertically. Although you may feel nervous about it, thanks to all the padding on the bag itself and the dividers, you should be totally fine throwing a naked camera in here. 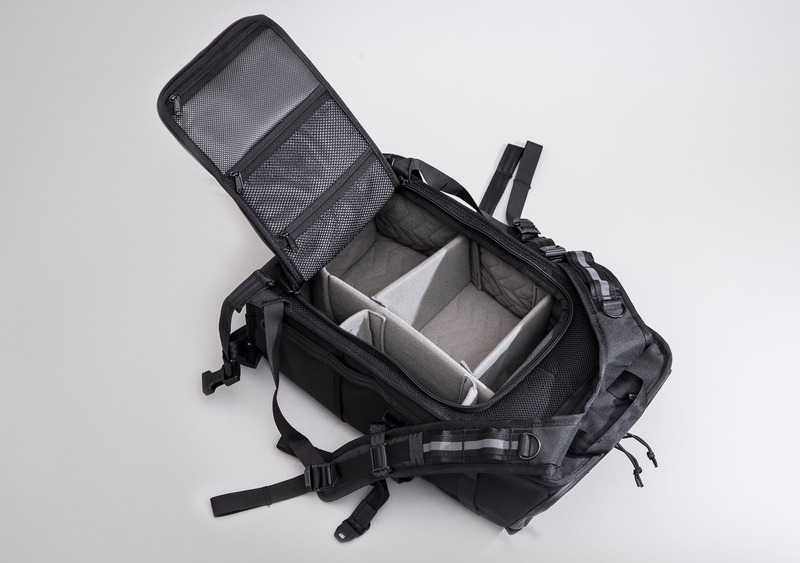 While the obvious goal is to use these to organize your camera gear, you could also take them out and use this part of the bag like a regular clamshell if you wanted. This is a nice bonus that makes this bag more versatile than your average camera bag, which we like. We have been testing the Chrome Niko for 4 months. 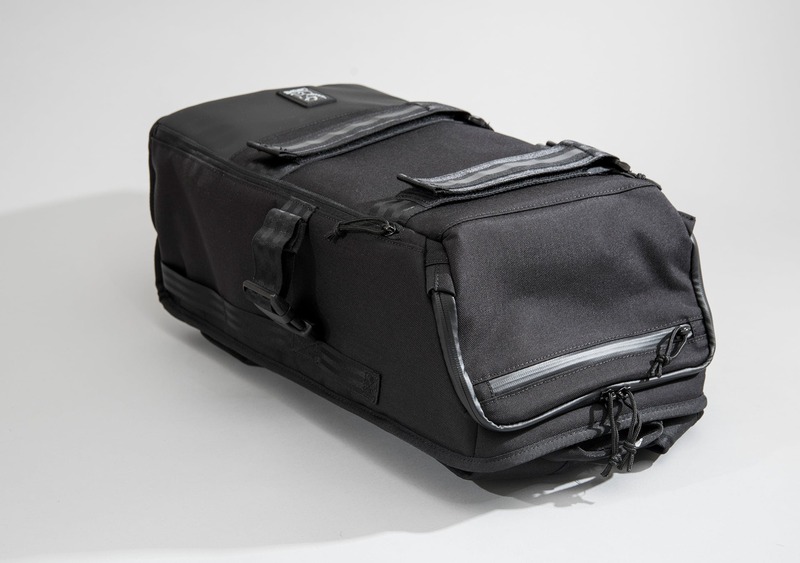 Overall, the bag is a great option for photographers who need to carry around a good deal of lenses and gear with them. While we liked the overall layout of the bag and many of the features, we did feel like we weren’t entirely utilizing the full space of the bag. However, this is mainly due to the relatively simple camera kits we tend to use. If you’ve got a sizeable kit or you’re looking for something that can easily handle your camera gear, clothing, and other essentials, the Chrome Niko is a good bet. Our main complaints are with the tripod carrying system and the laptop compartment. The tripod system seems to be better suited to a skateboard than a tripod, in all honesty. And while it does get the job done it can be 1) difficult to lay the pack down when you’ve got a tripod strapped to the back of it, and 2) difficult to access the gear inside when you’ve got a tripod attached. It just seemed like an after thought—the actual mechanics of using the bag are altered significantly when you’ve got a tripod on it. 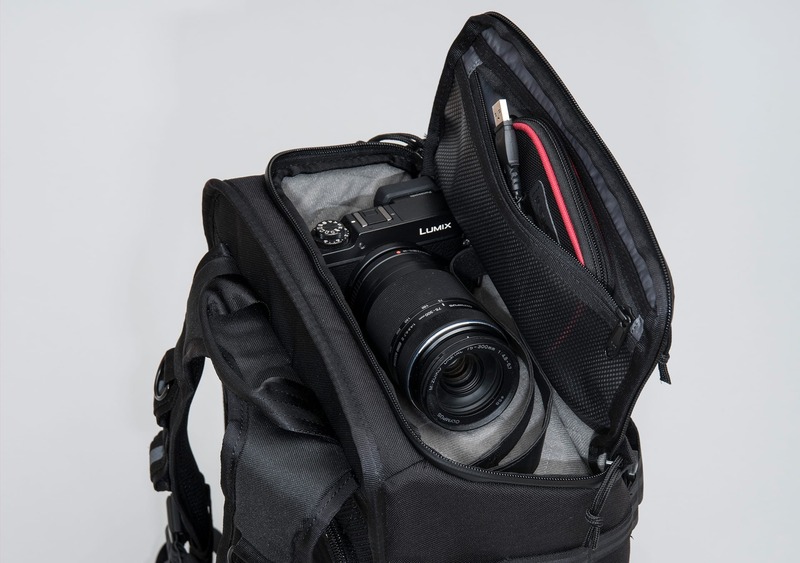 For a professional photographer who is constantly needing to go in and out of their pack, the tripod carrying system seriously affects the rhythm of this bag. That being said, if you’re the type of photographer who is going to be unloading your kit in one spot and not moving around too much or swapping things out, the Chrome Niko might be a great option. A 15″ laptop will fit, but it’s a bit snug! Working fine. Getting used to the entry system… Definitely a change from other camera packs we’re used to. Going strong, everything on the pack has been working well and no major complaints other than some dust and dirt clinging to the back panel. Starting to see some thread fraying on the edge of the reflective straps. Nothing catastrophic. The rhythm on this bag still feels a bit off. 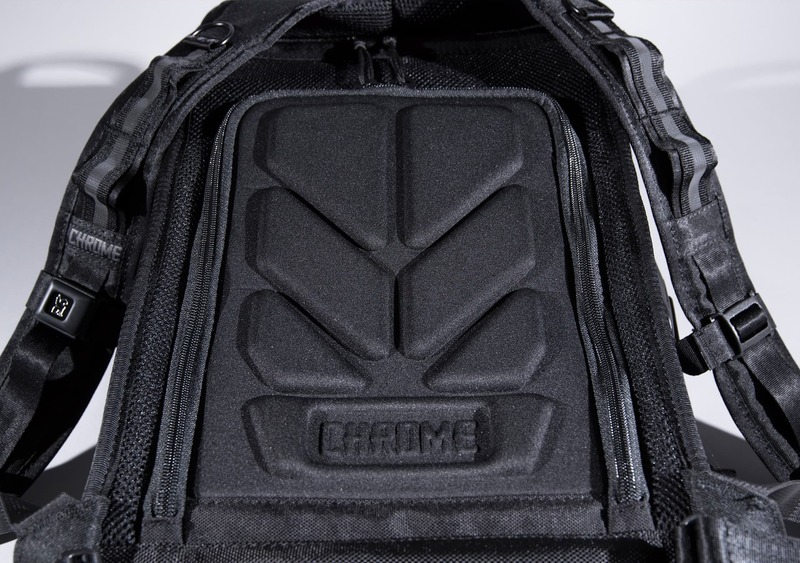 Very comfortable pack—lots of cushion on the back panel and shoulder pads. Very water resistant—water seems to bead off the bag. Lots of useful loops straps and pockets on the exterior. Taking the pack off to access the main compartment might be cumbersome for some users. Laptop compartment is restrictive for larger laptops. The tripod system is a little wonky. 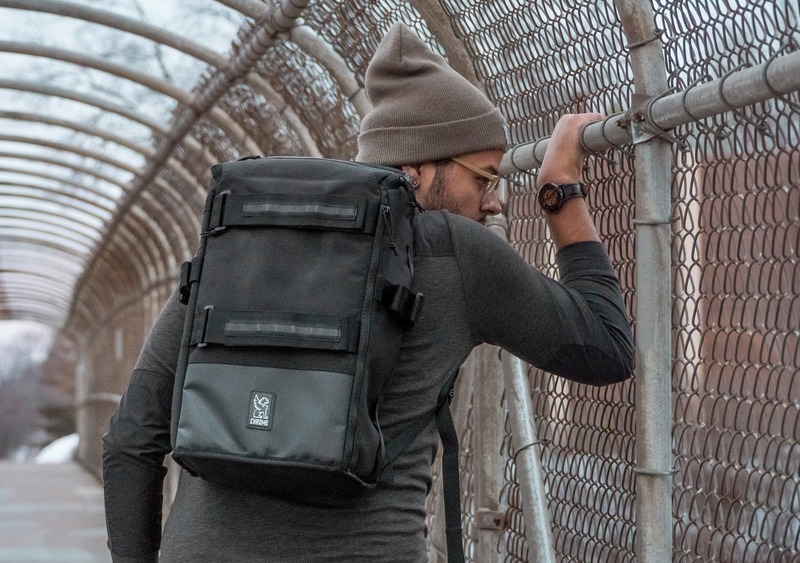 The Chrome Niko F-Stop Camera Backpack is another great example of how Chrome is able to blend functionality, durability, and style with their signature branding. This is a sizable camera bag that can hold a good number of lenses, camera bodies, and any other accessories you may need. It is equally good for the professional photographer or traveler who wants to carry some camera gear in addition to their travel loadout. While we love the look of this pack and some of the unique features, there were a few hiccups. 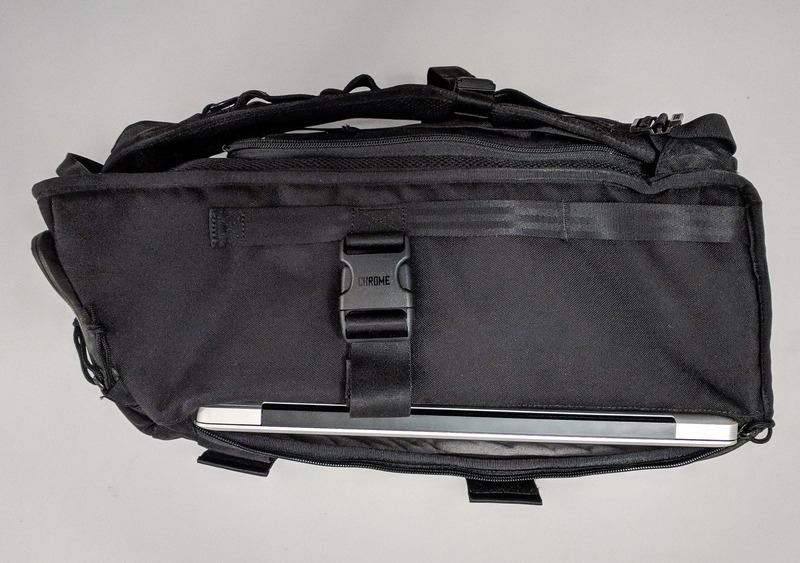 In the end, this was a dealbreaker for us—we do think that many photographers and/or travelers out there will find this bag to be perfectly suitable for their needs. Jared Martin is a full time photographer based out of Minneapolis Minnesota. 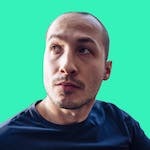 He has experience with multiple forms of image making and has tested gear from nearly every camera system platforms (yeah - he's one of our expert photo guys). He enjoys creating still life scenes along with documenting his explorations and experiences.